DEANNE BUTTERWORTH AND MATTHEW DAY’S DANCEHOUSE DOUBLE BILL IS AN APT PAIRING, EACH PERFORMER EXUDING A PALPABLE SENSE OF COMPULSIVE PURPOSE WITH INTENSIVELY FOCUSED BODY-WORK IN SPACES TIGHTLY FRAMED BY LIGHT, SHADOW AND ENVELOPING SOUND. THERE IS NOTHING LITERAL TO HANG ON TO HERE—ONCE AGAIN IN DANCE MASSIVE WE ARE ALL VERY MUCH IN THE MOMENT. Butterworth’s Dual Repérage in Threes works the length of the venue’s upstairs Studio. To our far right, the choreographer-dancer appears abruptly, in a flurry of extensions, silhouetted in front of a human scale rectangle of bright, softly coloured light. Butterworth’s relationship to this light source is pivotal: she constantly moves away from it to the centre of her stage, sometimes further, only to return to it, sometimes moving backwards into its acute frame. The dancer is not miming push and pull, but the magnetism is evident—sometimes in a mere walk, sometimes as if she’s danced by an unseen force. As if to amplify the work’s anxious, moth-to-a-flame vibrancy, a hand-held torch lightly tracks Butterworth, casting a flickering shadow on the long wall as she moves into the dark. Michael Munson’s score resonates with the dance; initially short, deep chords and high piano twangs suggest the solidity of acoustic sources, providing a palpable physical sonic pattern against which the dancer’s restive body moves regardless. As Dual Repérage in Threes evolves, Butterworth’s choreography takes shape, cumulatively building on a calculatedly limited set of movements with occasional, strikingly different images (sculpted posturing, balletic tip-toeing, feet ‘stuttering,’ rapid pelvic thrusts) breaking the routine. The dancing’s not minimalist as in, say, some Molissa Fenley works, but the recurrence and recombination of motifs can be hypnotic or, at times, hard to hold together. Arms lead the body in wide turns, swing over shoulders singly and then together, back and forth at speed; hands spin rapidly over each other; and, in a dominant image, the dancer’s upper body is constantly pulled down towards the floor, centrestage, hands reaching, half-cupped as if something sighted is beyond grasp—the strange potency of this gesture is heightened by the addition of a percussive element to the sound score. The work is played out in two sections—there is a ‘private’ third that only Butterworth experiences or we can imagine, as she suggests in her opaque program notes. As the first ‘act’ progresses, the pull of the light is amplified when it turns slowly, softly orange, Butterworth travelling elegantly sideways, then walking serenely towards it. On arrival, she oscillates between bursts of energy and calm, drifts back to the centre, again as if seeing…what? Sweet organ-like tones fill the space. Black-out. 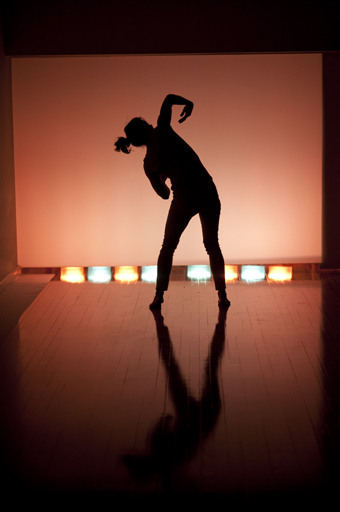 Butterworth stands over a flickering fluorescent light as she commences her second ‘act,’ in which the rectangle of light is a vivid orange, and the images into which she recurrently locks are more intense, more urgent while others—like squared-off poses, moments of rare stability—are added. A thin line of lilac light illuminates the space where wall and floor meet, drawing a crawling Butterworth away from her principal light source, perhaps into some kind of release. In a moment that seems to break even further from the work’s patterning, Butterworth is no longer compelled to bend low; instead she clenches a fist and reaches out directly to us. It’s a powerful almost implicating moment, if again an abstract one. In the work’s climactic moments, Butterworth returns to the light, a deep musical pulse underlining a frightening escalation of the work’s key motifs—arms and hands spinning, body pulled down and forward over and over. I’m not sure precisely what I witnessed in Dual Repérage in Threes, but Deanne Butterworth’s adroit coding of her choreography (inflected with years of dance know—how, superb balance and rapid gear-shifting) and the work’s near obsessive—compulsive realisation made for a compelling experience. A second viewing of Thousands confirmed for me the work’s peculiar, tension-driven power. Day maintains his performance constantly on the pivot of transition, always moving in minimal increments, such that the tension required not to topple or speed up creates a bodily vibration that is at times exhausting to watch but which provides the work with its pulse. This time I was hyper-alert to the meticulous shifts in movement: an arm leads out left, the direction Day is facing, but the palm of the hand faces us while the rest of the body slowly but with determination turns to the right. As part of Dance Massive, Thousands was performed at one end of the Dancehouse Studio against a white wall and on a polished timber floor. In terms of space and focus this created a very different ambience from the Sydney performance at PACT. There, Day’s black outfit was in sync with dark floor and walls. Here, the sheen of surfaces and the scatter of shadows reduced a little the work’s sense of sheer singularity. (In the second part of his trilogy, Cannibal, Day, in white clothes and hair, works a large white space in which shadows play an essential role: see RealTime 102, April-May.) Nonetheless, lighting designer Travis Hodgson (who also lit Cannibal), using strong down-lighting, manages to fix our attention while floorlights create shadows to amplify momentary, chance associations with, among others, sporting heroism, Soviet Realism, Rodin and Buddha. James Brown’s monumental score also generates associations. Its enormous pulsing rumble feels like we’re sitting atop a giant machine, then stuck in a tunnel facing an oncoming train, then the target of hovering helicopters. But Brown’s composition is never literal, its long throbbing, humming lines magnifing the sense of body tension, although not in calculated sync with Day’s staccato internal beat, until the disco passage where music and body become one, Brown making even more of the flying bass lines than usual in that idiom. Of course, Day never deviates from his own pulse, making for some of the most restrained club dancing of all time. Rosalind Crisp’s No one will tell us…, Luke George’s NOW NOW NOW and Deanne Butterworth’s Dual Repérage in Threes, in their very different ways deliriously engage with the notion of the moment. So does Matthew Day’s Thousands, not with improvisation or an open structure as its foundation, but with the ‘high-wire’ on-the-floor skill of maintaining balance and precision at the slowest of motion in the strangest of dances.